Fifty years ago, when I was a young christian, there was a clear division in New Testament studies between scholars who defended historic christianity and more secular scholars who took an extremely critical view of the New Testament and saw little of historical value in the gospels. Half a century later, and things are very different, and secular scholarship is much more confident of historical facts about the life of Jesus as recorded in the gospels. Much of the change has occurred this century. Here is a brief summary. We wouldn’t expect to find much direct archaeological evidence for an itinerant Galilean teacher and miracle-worker like Jesus, but some recent archaeology supports the historicity of the gospels. John’s gospel describes a healing by Jesus at Bethesda, a pool with five covered colonnades near the sheep gate. For many years nothing was known of the pool, and John’s gospel was considered to be somewhat fictitious. 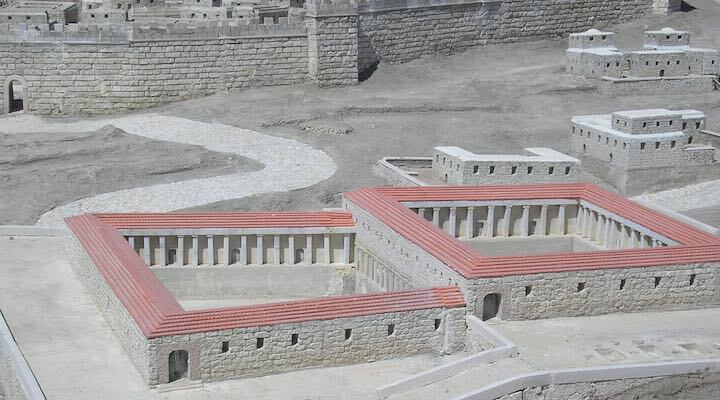 The remains of the pool (actually two connected pools) were discovered more than a century ago, but the existence of the five colonnades was only confirmed more recently. In 2006 Urban von Walde included Bethesda in a list of twenty geographical references in John that show that the author had a good acquaintance with the geography at many places Jesus visited, some of which were changed not long after Jesus’ life. The narrative material in John is apparently more historically reliable than was once thought. Various tombs and burial items have been associated with Jesus, with varying degrees of plausibility. The James ossuary (a box to hold a person’s bones) is believed by some to be that of James, the brother of Jesus, as its inscription says, which would make it the first known archaeological reference to Jesus. However while the ossuary itself may be genuine, there has been much unresolved debate over the authenticity of the inscription. Another ossuary of Caiaphas, high priest at the time of Jesus is considered genuine. The Talpiot tomb, south of Jerusalem, contained 10 ossuaries, including one possibly labelled Jesus son of Joseph (though the inscription isn’t clear) and others possibly labelled with other names in Jesus’ family. Some call this the “Jesus family tomb“, but almost all archaeologists say there is no evidence for this (the names are common and not at all clear). If the identification was more certain rather than speculative, this discovery would be difficult for christianity. It has been argued by some scholars that the idea of a suffering Messiah was quite foreign to Jewish thought, and was invented by grieving and stressed disciples to “explain” how the Messiah could die. But translations of difficult-to-read text on a stone tablet dated to just before Jesus indicate it mentions a messianic figure who would suffer and die to achieve his mission, and perhaps also that he would rise from the dead in three days. This lends support to the possibility that Jesus saw his mission in this way, and it wasn’t an invention of his disciples. A small band of sceptics have disputed that the village of Nazareth existed at the time of Jesus, thus throwing doubt on the accuracy of the gospels and even the existence of Jesus. However in the last decade archaeologists have uncovered the remains of two houses in Nazareth that they date to around the time of Jesus. Almost all scholars now believe Nazareth was a small village of perhaps 50 houses, perhaps a little more, when Jesus would have grown up there. The gospels record Jesus preaching in synagogues in towns and villages throughout Galilee (e.g. Matthew 9:35). However until recently, synagogues were known to have existed in major towns, but none in the smaller villages and countryside, leading some to wonder whether this statement in the gospels was true. But recently the remains of a synagogue on a rural estate in Galilee (near Mt Tabor and not far from Nazareth and the Sea of Galilee) were unearthed and dated to about the time of Jesus. None of these discoveries goes anywhere near proving that Jesus lived as the gospels describe. But they lend support to veracity of the world depicted in the gospels and in some cases show that some sceptical claims about Jesus are on shaky ground. As scholars discover previously unknown documents (like the Dead Sea scrolls) and “new” archaeological remains, their understanding of first century Jewish culture and religion, and of the New Testament, grows and changes. A few trends are interesting. But it is now fairly well established that Jesus’ disciples (who were monotheistic Jews) were worshiping him alongside God from very early times. There is still argument over how much this reflects teaching they received from Jesus, and how much this would have been influenced by their visions of the resurrected Jesus, but it makes it virtually impossible to say that worship of Jesus as divine only began long after most of his first disciples had died, and under pagan influences. While christians have always regarded the gospels as historical records, critics haven’t always taken that view. Some sceptical scholars have regarded them as fiction, allegory, or legend. There have been debates over how long after Jesus they were written, and whether they contained eyewitness reports. It was once thought (by some) that John was total unhistorical and probably written late in the second century. But scholars seem to be now fairly agreed that the gospels are historical biography, a genre that required an accurate, albeit complimentary, portrait of the main figure. John’s gospel is now known to have been written by the turn of the century (a fragment of the gospel dated about 125 CE has been found) and its narrative sections have been shown to have a better historical basis than once thought. In a surprising development, James Crossley and the late Maurice Casey argued, based on internal evidence in the gospel, that Mark’s gospel was written as early as about 40 CE. This would make it a very early and accurate record of Jesus’ life. The idea hasn’t caught on (yet) but it shows that the conventional dates of the gospels (65-95 CE) are not set in stone. Were the memories of eyewitnesses passed down reliably? This is one area of significant change. For most of the twentieth century, New Testament studies were dominated by form criticism, a method of biblical analysis that sought to classify units of scripture into literary patterns (such as love poems, parables, sayings, conflict stories, etc) that have been passed down orally before being written down in the gospels we have today. Form critics generally concluded that the various gospel stories and sayings had been changed and added to in the process of oral transmission, and often led the critics to be pessimistic that the original stories and sayings (and hence the “historical Jesus”) could now be known. However several developments in New Testament studies – studies of how events and teachings are remembered, passed on and interpreted in ancient and modern oral societies – have changed a lot of this. Most scholars accept that the stories and sayings found in the gospels originated with eye-witnesses, however much they may or may not have been distorted along the way. The gospels and the mentions of Jesus in other NT documents are too close to the events for them to be complete legends or fabrications. History always involves interpretation of events, and would lose a lot of its value without interpretation. The gospels record those parts of the history of Jesus that were important to the community of believers, and how they were understood. The literacy of the non-elite social classes in first century Israel is much argued over, with some arguing that probably neither Jesus nor his disciples were literate enough to write down teachings and reports. However some Jewish scholars argue that Jesus must have been well able to read to be able to dispute with “scribes and Pharisees” about matters of law and rabbinical arguments. Matthew the tax collector was also probably literate enough to write down sayings, which one ancient writer (Papias) records him as doing. The literacy of Jesus and the apostles is an open question. However widespread illiteracy meant that stories and sayings were more likely to be passed on orally; even written material would have been read out or “performed”. Memory studies show that people can wrongly remember events which they witnessed, but also that they can also sometimes remember with remarkable accuracy. Unusual, important or emotionally involving events can generally be better remembered. Memories often become a remembering of the memories rather than of the event, but frequent rehearsal, especially by a group, aids accurate remembrance. Some scholars say that Jesus, like other rabbis, probably used techniques to help or even force his disciples to learn and remember his teachings. In any case, collective memory, not individual memory, is what is involved here, and this can be much more reliable. The transmission of material orally is far from the random, unreliable, “telephone game” process that older scholars sometimes suggested. Based on studies of oral communities, scholars generally believe that the community as a whole would have kept story tellers to the known main facts, and tradents (elders or scribes) acted as some sort of “control” on the telling of the tradition. The result was that oral traditions moved towards “fixed and durable forms” (Anthony Le Donne & Tom Thatcher), and oral transmission was arguably as reliable as written (which required repeated copying). This form of transmission tended to lead to stories and sayings being passed on many times, all pretty much the same at the core, but with different minor details included or omitted at different tellings depending on the audience and setting. There was thus probably not a single “original” version of any story or saying, and those who finally compiled the written gospels would have chosen the version most suitable for their purpose. We don’t even know for sure if there was a single authoritative version of any of the gospels, or whether they went through a process of editing. This explains why the main facts and teachings recorded in the gospels agree but some of the details vary. It also puts in context the criticisms of some sceptics that the gospel authors/compilers were not eye-witnesses – this may or may not be true, but given the process of collective memory and transmission, it hardly matters. Arguments will continue over how reliably we know Jesus’ words and actions, but recent NT studies seem to show that the gospels are neither “inerrant” nor legendary, but a record of what the early christian communities remembered and found important, and how they interpreted them. Jesus really did exist as a first century Galilean teacher and miracle worker (whether one believes he actually worked miracles or not, that was how he was perceived). We can be fairly confident that we know a significant amount of his teaching and actions, enough to understand who he was and what he was aiming to achieve (even if there are some disagreements about this). Even if we may not be sure of his exact words sometimes, we can be reasonably confident we have his teachings. Whether we interpret his life as showing he was the Jewish Messiah, the unique son of God, who established the kingdom of God on earth, or whether we see him as an ultimately unsuccessful prophet and teacher, remains a choice for each of us. The historical evidence appears able to support either interpretation.